One clustering algorithm offered in scikit-learn that can be used in predictive analytics is the mean shift algorithm. This algorithm, like DBSCAN, doesn’t require you to specify the number of clusters, or any other parameters, when you create the model. The primary tuning parameter for this algorithm is called the bandwidth parameter. You can think of bandwidth like choosing the size of a round window that can encompass the data points in a cluster. Choosing a value for bandwidth isn’t trivial, so go with the default. Use a new Python session so that memory is clear and you have a clean slate to work with. Mean shift created with default value for bandwidth. Mean shift produced two clusters (0 and 1). A scatter plot is a good way to visualize the relationship between a large number of data points. It’s useful for visually identifying clusters of data and finding data points that are distant from formed clusters. 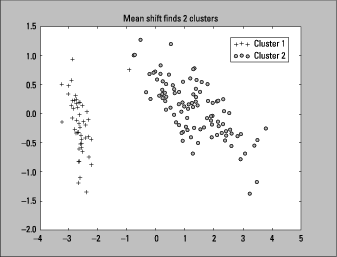 Mean shift finds two clusters. The scatter plot output of this code is shown here. If the chosen value is too big, then the clusters will tend to combine and the final output will be a smaller number of clusters than desired. If the chosen value is too small, then the algorithm may produce too many clusters and it will take longer to run. Mean shift didn’t produce the ideal results with the default parameters for the Iris dataset, but a two-cluster solution is in line with other clustering algorithms. Each project has to be examined individually to see how well the number of cluster fits the business problem. The obvious benefit of using mean shift is that you don’t have to predetermine the number of clusters. In fact, you can use mean shift as a tool to find the number of clusters for creating a K-means model. Mean shift is often used for computer vision applications because it’s good at lower dimensions, accommodates clusters of any shape, and accommodates clusters of any size.